African-inspired dance and music troupes will fill the Gas Station Theatre on Thursday for a four-day show. 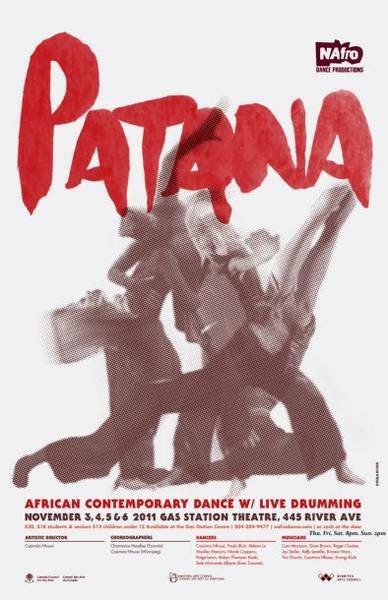 Patana III — an exchange of choreographic voices — was crafted by NAfro Dance artistic director Casimiro Nhussi and guest choreographer Charmaine Headley. The venue will be filled with 64 African hand drums “djembes”, and at the top of the evening, the audience will be given the opportunity to play and chant along with NAfro’s leading musicians Jay Stoller and Casimiro Nhussi. Showtimes from November 3 to 5 are 8 p.m., with a 2 p.m. show on Sunday, November 6. Tickets are $20 for adults, $18 for seniors and students, and $12 for children 12 and under. Tickets can be purchased at the Gas Station Theatre (cash only), at NAfrodance.com or by cash at the door.